CLEAR SCRAPS-Stencil. 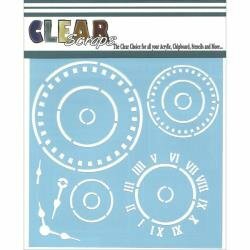 Use this translucent plastic stencil on all kinds of projects including for adding creative designs with paints, inks, chalks, misters and many other mediums to a paper project. This package contains one 12 x 12 inch stencil. Available in a variety of designs, each sold separately. Made in USA.